Scientific Misconduct Blog: Micro Statistics Tutorial 04: Power - Can Schering Plough count? Comments on: Micro Statistics Tutorial 04: Power - Can Schering Plough count? Perhaps I am missing your point, but according to the press release, the number of patients in the study was 720. So does it matter that they originally projected a lower number? Also, a friend of mine told me that he calculated the SD from the treatment changes and the p values and that it was about 0.06 mm. So even if there were as they say a lot of outliers or biologically implausible IMT values, they still achieved a SD that was lower than they projected. No this is not the issue. they did power the study (and did eventually study enough people) to show what they wanted to show (if it were true). Generally studies recruit more than the number specified by the power calculation in order to account for un-evaluable patients (dropouts etc). This is a different point. Their prior power calculation was in error. They can't do math (or write comprehensible, reproducible science). - making the claim of "lots of outliers" implausible. I am simply pointing out a sloppy error. 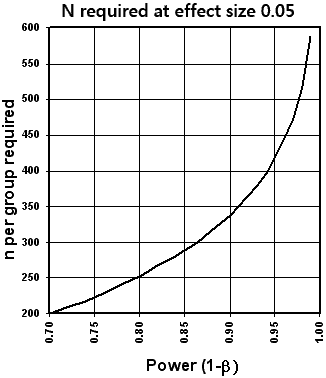 The original 650 was not "a projection" of numbers. It was the required minimum number to achieve a given power given their prior assumptions. Dr Blumsohn, I have checked your calculations. You are correct that their numbers are in error. I suspect they might say it is just a bit of rounding error - after all, what are 25 patients between friends. It is surprising that this was noticed before (by reviewers or writers) as you suggest. Yes they could claim rounding error (accounting for the 25 missing patients). In fact an assumed SD of 0.196 (just making it in terms of rounding) would just account for their difference. However they did not give a value of 0.196, and if they did, they would need to account for the origin of that odd estimate. The issue remains - the calculations they presented as a prior estimate of N required are not internally consistent, and not reproducible. Its a small thing, but it gives some insight into the way in which the process works. It also bypassed all scrutiny. If I were a peer reviewer (or an author) I would have spent five minutes trying to repeat the calculation given the information supplied, but clearly no-one did. Or maybe my estimate of power (from the assumptions provided) is wrong. I don't think so.